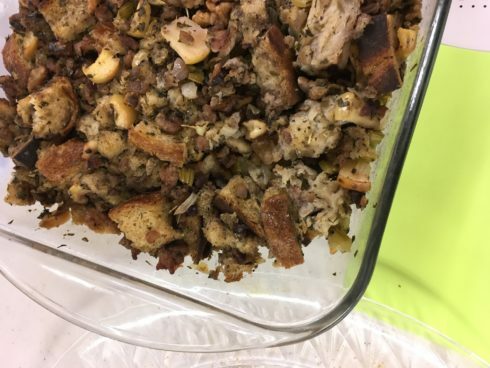 A stuffing recipe that not only highlights local bread, butter, and sausage, but also local apples! Preheat oven to 350 degrees F. Lightly oil a 9 x 13 baking dish or coat with nonstick spray. Spread bread cubes in a single layer on a baking sheet. Place into oven and bake until crisp and golden, about 10-12 minutes; set aside. Heat olive oil in a large skillet over medium heat. Add pork and cook until browned, about 3-5 minutes, making sure to crumble the sausage as it cooks. Remove pork from skillet and place in a bowl. Melt butter in the skillet the pork was cooked in. Add garlic, onion and celery, and cook, stirring occasionally, until tender, about 4-5 minutes. Stir in apples, sage and thyme until fragrant, about 1 minute. Spread bread mixture into the prepared baking dish. Place into oven and bake until top is browned, about 45 minutes.